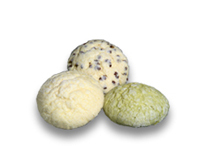 Products Line ['MELON' Bun Line] | OSHIKIRI MACHINERY LTD.
A MELON BUN is a unique bun which is covered with biscuit dough and looks like musk melon. 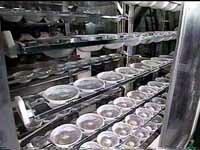 As the result of pursuit for a beautiful round shape, Oshikiri developed an Automatic Production System for Melon Buns. 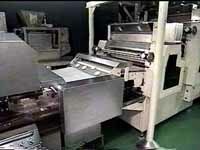 This system consists of 2 kind of equipment for bread dough and biscuit dough. 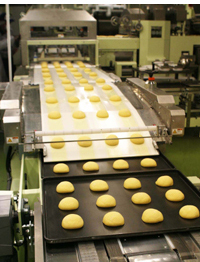 This system is also applicable for Roll bread production. Standard 8 pocket Proofer does not have any empty pockets by operating synchronously with Rounder. 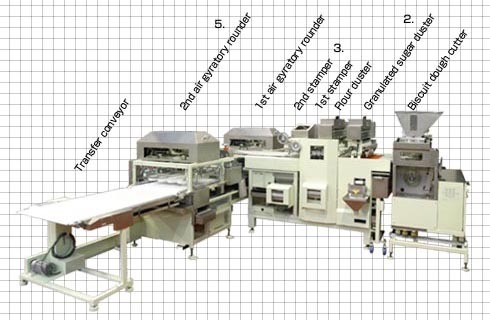 Centering unit for biscuit dough. 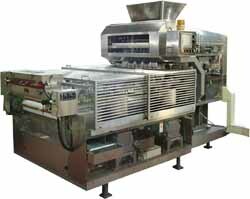 Spray unit for better adhering biscuit dough to core dough. Reciprocation unit for the best timing of merging of two kinds of dough. Spray the water on the core dough to attach biscuit dough to core dough. Sugaring amount can be adjustable by inverter control. Stamps the dough so that the center become thicker and circumference thinner. 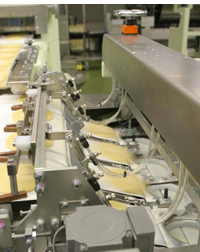 Gently overlays biscuit dough on core dough as the gate opens with descending. Gyrates biscuit dough together with core dough. Claws on the cup bottom put the biscuit dough in the bottom of core dough. Reticulation stamping on a pan.